My greatest pleasure is taking people to parts of the world that they never could have imagined in the hopes that they will become inspired to protect them and the creatures that inhabit them. “If I only had 5 days to live I would spend 3 of them at South Georgia; the other 2 would be spent getting there.” Fortuna Bay – simply picture-perfect. No two icebergs are ever alike. And if they have penguins on them, such as these Chinstraps, ice doesn’t get any better. Only in the Arctic can one feel like Gulliver, a giant amongst the flora and fauna. This Arctic Willow (Salix Arctica) on Ellesmere Island creates a dense carpet just a few inches tall. In 1900 over 100,000 Cheetah ran over their historic range. Today an estimated 9,000-12,000 Cheetah remain in the wild in Africa. Botswana is one of my favorite places to view them. Described as “a rose-red city half as old as time” by poet John William Burgon, the ancient city of Petra is carved into cliffs of solid, red sandstone swirling with color. Shirley Metz’s careers and accomplishments have spanned the globe. Born in Minnesota, she grew up in Europe and Hawaii, graduating from the University of Hawaii in Honolulu. Shirley became a certified diver at age 16 and while at UH did shark research earning her degrees in Marine Biology and Communications. She met her first husband in Hawaii with whom she founded Hobie Sports. She also developed several active clothing lines and consulted to companies such as The North Face. In early 1988 Shirley visited Antarctica and became inspired to work in Antarctic conservation. To raise awareness, Shirley became a member of an international expedition that would attempt to ski 800 miles from the edge of Antarctica to the South Pole. On January 17, 1989, the nine-member expedition arrived at world’s end; Shirley made history and her way into the Guinness Book of Records as the first woman to ski overland to the South Pole. Following a chance meeting in Antarctica in 1990 Shirley married Peter Harrison and together formed the successful travel firm, Eco-Expeditions. As a Board Member of the Friends of South Georgia, under the auspices of the South Georgia Heritage Trust, Shirley raises funds for conservation and continues to promote awareness and support for environmental issues. She is a member of the Explorers Club and The Society of Woman Geographers. 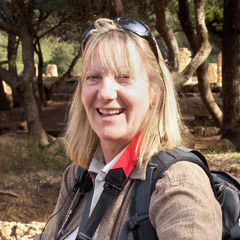 Shirley continues to lead expeditions, both private and commercial. As a professional photographer Shirley documents her travels and lectures on various topics, including her South Pole expedition. Discover the remote coastlines of Great Britain and Ireland, exploring geological wonders, archeological sites, and rugged cliffs alive with massive seabird colonies. See Polar Bears and Pacific Walrus on Wrangel Island, visit Chukotka’s indigenous villages, and look for Gray Whales in the Chukchi and Bering Seas. 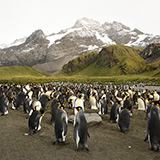 A South Pacific odyssey with awe-inspiring scenery, world-class snorkeling, huge concentrations of seabirds, and fascinating history at both Easter and Pitcairn Islands. 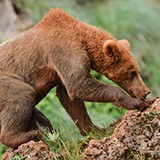 Untouched landscapes and wildlife encounters, including bears, rivers choked with salmon and clouds of birds that move across the sky like swarms of locusts. Ask Shirley a question about her upcoming expeditions? 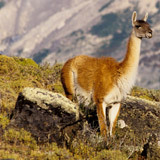 Patagonia Chile Tours: One Guanaco; Two Guanacoes? Lama guanicoe, or Guanacos (correct spelling for the plural of “guanaco”) are humpless camels of the arid and semi-arid habitats of southern South America. Found at elevations up to 14,500 feet, they are related to camels, as are Vicuñas, Llamas, and Alpacas. Standing between 3.5-4 feet high at the shoulder they weigh up to 300 pounds. Found in groups of up to ten females, the young, and a dominant male adult, guanacos are the largest native herbivore in Patagonia. Their soft, padded feet tread on soil and vegetation without damaging the environment and they conserve water like other camels.